Hola todos, what a week! I hope this email finds you all happy and safe. Esta semana has been unforgettable. Definitely a powerful, testimony building week this week. Highlight of the week was Saturday, hands down. 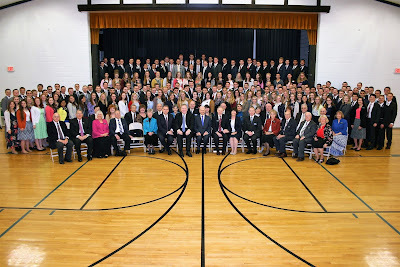 We had a mission conference where the whole mission gathered for a meeting in Bloomington. We were privileged to meet and hear from Russell M. Nelson, President of the Quorum of the Twelve Apostles!! As well as, Elder Rulon F. Stacy and Craig C. Christensen, both incredible general authorities of our church. We took a huge mission picture with them, and then all 200 of us got to individually shake each of their hands as we walked into the chapel. Amazing experience! The spirit that radiates around these men is so profound! We heard an amazing talk from Elder Stacy about softening our heart, turning to our Savior, and being sanctified through His atonement. President Nelson talked about our purpose as missionaries and how we are striving to help people repent and become truly converted to the gospel of Christ. He also taught us about the importance of the Book of Mormon and the scriptures in our lives, and especially our lives as missionaries. A quote I really love from him was, "The Book of Mormon is like air, you don't really realize how much we need it until you can't have it." The Book of Mormon restores plain and precious truths and contains the fulness of the gospel. It is the keystone of our religion, take it away and the whole arch crumbles. I know this is Christ's church because I know the Book of Mormon, as a companion to the Holy Bible, is the word of God! Then, in the evening, we got to hear all three of them AGAIN! They had a YSA Fireside and we got to join a recent convert and some other young single adults from the ward that drove up. Just an absolute spiritual feast! After the conference, since we live about an hour south, we received permission to work with the Minneapolis Spanish elders for the afternoon! That was my companion's last area, so Elder Christiansen wanted to see a few old investigators he was teaching. We had a good time, and even had a really powerful lesson with a Hispanic girl named Carmen and convinced her to come with us to the to the Fireside with President Nelson. Since the Fairmont Elders drove up with us to the mission conference, they got permission to stay for the fireside as well. Unfortunately, the Minne elders couldn't find a ride, soo we may or may not have stuffed 6 elders into our tiny Corolla all the way up there 😂. So uncomfortable. But don't worry, we made it there safely haha. They had a really good question and answer session where they talked a lot about how we receive answers and guidance in our lives from our Heavenly Father. And also some powerful testimonies at the end from all three of them. There was a beautiful musical number sung by some of the youth in the congregation with powerful, peaceful spirit. It made me reflect back on the personal revelation that I have received through the Holy Ghost, that come to a knowledge of the things I grew up believing, to now knowing them to be true for myself. I know that God answers all of our prayers, He wants to guide us and direct us and if we turn to Him in sincere and humble prayer, we can feel of His divine love for us and gain a testimony of the things that are true. I felt the Spirit testify to my heart that these men are called of God, and hold the priesthood power and authority to direct Christ's church today. It was an unbelievable day in my mission that I will never forget! We had a really cool lesson this week with one of our progressing investigators, Theresa. It's always super difficult to have a lesson with her because she has two tiny dogs that yap and try to run out in the street, and a very energetic and active little 6-year-old daughter. She always has such a hard time focusing (just like me haha). So we devised the perfect plan.. Chalk! We gave her some chalk to draw us a picture on the sidewalk, and in the mean time we drew out the whole Plan of Salvation on her driveway! It was perfect, because while she was distracted we were able to teach Theresa the whole lesson and testify to her of the purpose and hope the knowledge of the plan really brings into our lives. She loved it, and it was really funny because we explained to her when we are resurrected, our bodies will have no more imperfections. She goes, "No more tumors? Man, that would be NICE!" (She has cancer). She got super excited about that, it was great! I absolutely love teaching people about God's plan of happiness because I feel like that part of my testimony has grown the most out here on the mish. And I love how the central focus of the Plan of Salvation is Christ's mission to come to earth and be our Savior, to atone for the sins of the world and allow us to return back to our Father in heaven! I am greatly disappointed, however, at the fact we forget to take a picture of our magnificent art-work :(. Next time. This week we had a zone blitz all the way up in Prior Lake. So all the missionaries in the zone met at this Target and we all split off into different parts of the sisters’ area to go do some finding! I was paired with an elder from Logan Utah, Elder Beach. We went tracting in some town-homes and found a super cool older gentleman with a pretty unique name - Orlando! He let us in and we taught him in his basement. He said he is Christian, but doesn't have a church he belongs to. 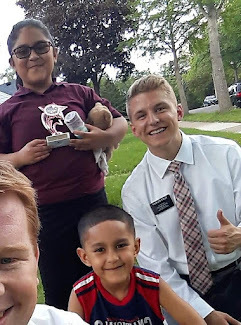 He asked us a ton of questions, and we were able to explain our beliefs in Christ and about the prophet Joseph Smith and the Book of Mormon. Too bad this guy isn't in our area so we can teach him because he was awesome! 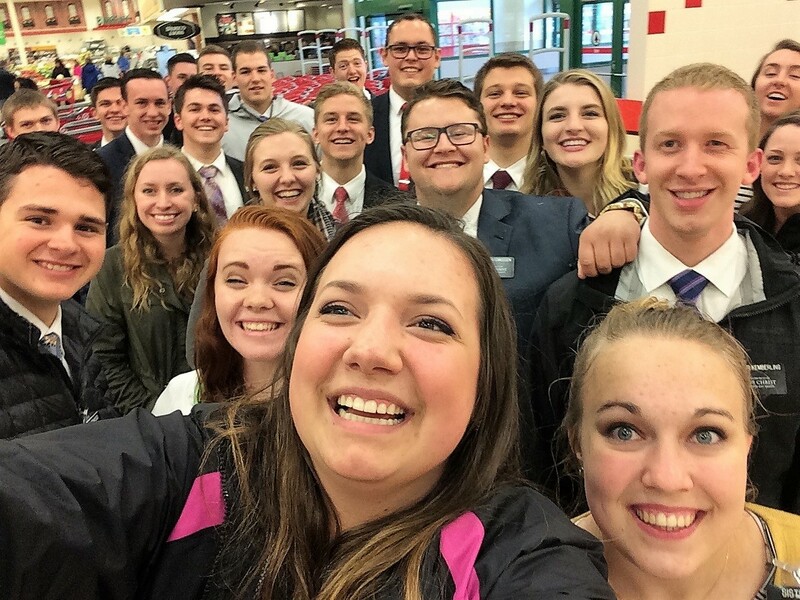 It was funny seeing all the missionaries meet back up in the Target eating area all sopping wet. Everyone walking past was like, "Woah, what happened to all you guys?" We were poured on with blessings, that's what happened!! Lol. That's all for this week, ¡Hasta la próxima!